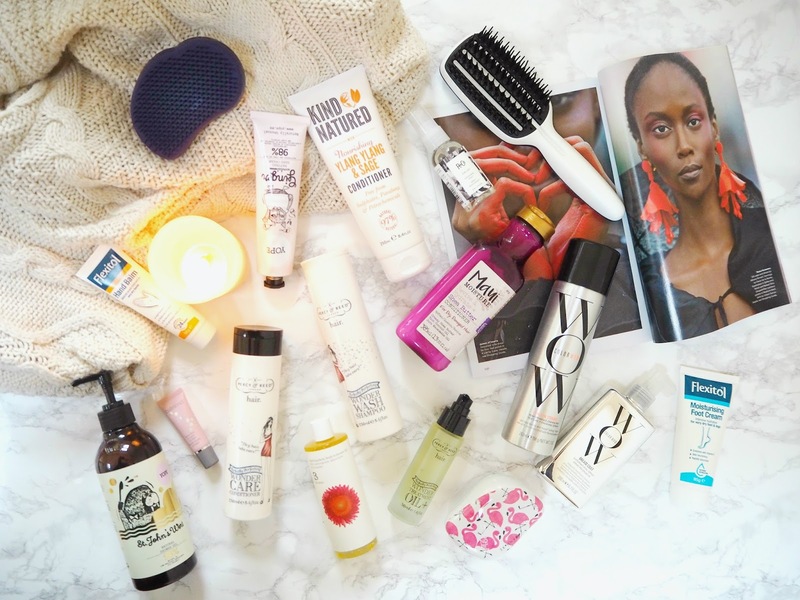 Over the past couple of months I've discovered some really great new brands and products in terms of haircare and body bits. Today I've rounded them all up to share with you! Yope Honey & Bergamot Kitchen Hand Soap* | £5.89 | I was recently sent over some bits to try from this all-natural brand and they have such adorable packaging (even the outer boxes that come with the products), as well as being very reasonably-priced. The scent of this hand wash is just beautiful! It's warm, sweet and fruity with bergamot and honey (which, it appears, is the perfect fragrance combination). I honestly find myself just there sniffing my hands for ages after I've used this! I kind of wish the shower gel came in this fragrance because it's so lovely. It has a gel formula and is reasonably foamy without being stripping. Yope Mineral Regenerating Hand Lotion* | £10.99 | This is a really difficult product to describe, but I'll try! The texture is lightly hydrating - somewhere in-between a cream and a lotion. It's one of the least greasy formulas I've tried (it almost feels fluffy) but it definitely still does the job. It has a neutral but also nice, soft scent - it's very fresh and clean and one that I think most people will enjoy. Yope St John's Wort Shower Gel* | £6.95 | I knew I wasn't going nuts when my mind immediately associated St John's Wort with the aisles of Holland and Barratt! It is a health supplement but, as it transpires, it also smells beautiful - it has a soft, sweet, warm floral scent. Again, this foams up really nicely, unlike some other natural formulas I've tried. Yope Hand Creams in Tea & Mint, Ginger & Sandalwood and Salvia & Green Caviar* | £7.90 each | I really love the pink metal tube packaging of these hand creams and the designs are again really lovely and unique. I'm a big fan of the formula of these hand creams - it gives lasting nourishment without leaving my hands slippery or greasy. The fragrances here are really unusual! There's a true tea leaf scent in the mix, as well as the warm, spicy blend of ginger and sandalwood and the slightly minty salvia and green caviar combination. Bramley Uplifting Bath, Body & Shower Oil* | £20 | I really love Bramley as a brand -their products are so underrated! Its roots are in the English countryside and the ingredients used reflect that. This is an invigorating scent with lemongrass, spearmint and coriander. As the name suggests, a couple of drops can be added into your bathtub to fill the room with this scent. It can be used on the body but personally I prefer a less 'heavy' oil like a dry formula for that. I like to use it as a nourishing shower oil - it smells beautifully and really helps retain the moisture in my skin. One drawback is the screw top - it's just a little bit faffy for the shower and I'd prefer a flip-cap! Flexitol Hand Balm* | £5.29 | If you're looking for an affordable, no-frills fix for seriously dry hands during the autumn / winter months then this could be just the thing. It is a balm, however it isn't anything overly thick or sticky or greasy. It's perfect if you want to apply something in the morning, and not find yourself with dry hands again partway through the day. It's an intensive product that really penetrates into the skin and nourishes it, relieving any tightness. Flexitol Moisturising Foot Cream* | £5.99 | This Vitamin E-based foot cream is really great - I'm definitely guilty of neglecting my feet, however I'm trying to be better! This is really great for dry, unloved feet - it isn't anything too heavy but it really does work, leaving my feet soft and smooth. It also absorbs so nicely, so you don't have an awkward excess sat on top of the skin when you're putting your socks on! Balmkind Alpine Rose & Lysine Lip Balm* | £14 | This lip balm isn't like any of the others in my collection - it has a very lightweight texture and a slight natural tint to it (which I really like) and more or less fully absorbs into the lips as opposed to sitting on top of them, only leaving a very slight shine. This makes it really great for wearing under lipsticks when you don't want the product's consistency to be altered by your lip care. It's nice and hydrating, leaving my lips soft and smooth without feeling as though there's much product on them at all. Maui Moisture Revive & Hydrate Shea Butter Conditioner | £8.99 | I'm absolutely obsessed with this conditioner and I'm definitely up for trying more from this brand now! The packaging makes this look like a yoghurt to me - though I like it, I do think it'll be hard to squeeze the last bit out as I draw to the end of the bottle due to its shape. That aside - this is an intensely nourishing conditioner for dry, damaged or brittle hair. It makes my hair shiny, keeps it looking and feeling healthy and, most importantly, doesn't leave a greasy residue or weigh my hair down. Tangle Teezer Blow Dry Smoothing Tool* | £20 | I pretty much always properly blow dry my hair but I've never had a dedicated tool for the job. This brush is designed to detangle and smooth the hair to make blow-drying quicker and easier. I do think my hair looks shinier and sleeker when I use this brush, however I do think the handle's design is a bit of a flaw - the way it's positioned means that you have hot air blowing on your hand, which is kind of uncomfortable! I'm a fan of the finish it gives but for the faff, I just prefer my Denman. This is the only 'skip' from the Tangle Teezer products for me. Tangle Teezer Original in Purple Glitter & Pink Rebel* | £11 each | Tangle Teezer also kindly sent over this glittery purple original brush, as well as a bright pink one with yellow bristles. I actually remember when this was on Dragon's Den years ago - I thought it was a great idea, the Dragons disagreed and I guess the rest is history! I used this loads back in the day but actually haven't had one in ages. The brush is designed to fit in the palm of your hand and the semi-magical bristles detangle without pulling, tugging, snagging or breaking your hair. Now that it's back in my routine, I can remember what I was missing! I usually tie my hair up overnight and then style it in the morning and I know I move a lot in my sleep - this helps to gently smooth and detangle it when I wake up. Tangle Teezer Thick & Curly in Salsa Red* | £11 | This version of the brush has longer bristles, designed for thicker and curlier hair types and I actually think this is my favourite product of the lot - even above the Original! I don't have really thick hair but it is naturally curly and I find this design quicker and easier to use for detangling. Tangle Teezer Compact in Glitter Gem & Skinny Dip Flamingo* | £13.50 | Tangle Teezer also have a compact version of their brush, which is perfect for throwing in your handbag and using on the go (there's a little case which protects the bristles). Obviously it's slightly more awkward to use a smaller brush, however this still works really well and I recommend it for post-gym or even just keeping in your bag at all times (just in case!) I have two designs here - this silvery glitter and black version and also a special white and pink flamingo edition in collaboration with Skinny Dip. 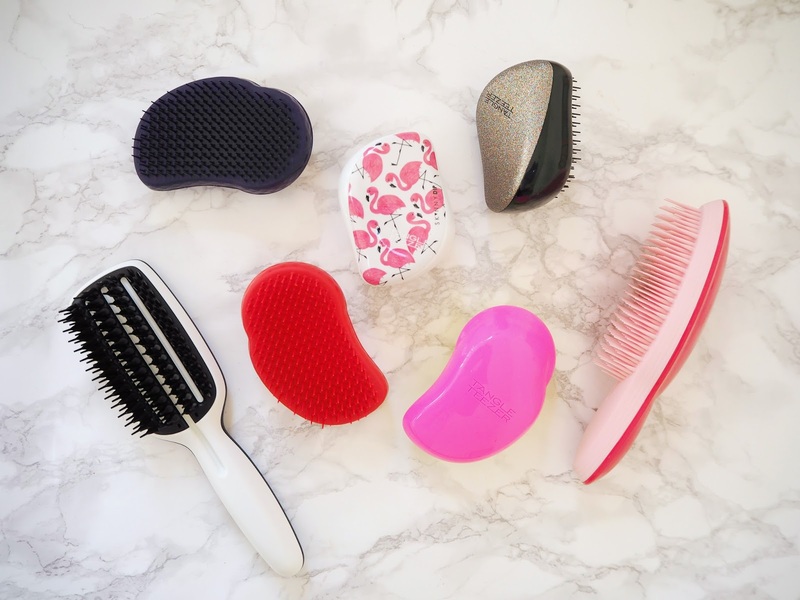 Tangle Teezer the Ultimate Pink Finishing Tool* | £15 | This is a multi-purpose brush that can be used for smoothing, detangling and back-combing the hair. It may not be entirely essential, but it does make creating volume a lot easier than with the original design. If you were after something like the Thick & Curly version (that has longer bristles) but you just prefer your brushes to have a handle then this is the one for you! However it isn't a must-have for me. Colour Wow Style on Steroids Performance Enhancing Texture & Finishing Spray* | £20 | I think this brand probably gets overlooked because the name implies it's only for coloured hair and its star product is a root cover-up, however from what I've seen so far: their styling products are absolutely fantastic! This is an all-in-one styling spray that adds volume, texture and hold to the hair without being gritty or sticking your strands together. I love that with a quick spritz of this, my hair just looks effortlessly styled and it's the perfect antidote to flat hair days! Colour Wow Dream Coat Supernatural Sealant* | £22 | I'm not sure if there's one of these is out there already, however this is well and truly the answer to my hair prayers! I'm one of those people who spends 20 minutes straightening their hair without thinking to look out of the window. Then, even if it's just spitting, by the time I arrive at the office my hair is a frizzy mess! You use this mist on damp hair before blowdrying and its effects aren't immediately apparent, as it's pretty much traceless. However my hair holds its style so much more when I use this! It stays pretty much entirely smooth and sleek on those drizzly autumn days. It's absolutely amazing and if you have this issue too, I absolutely suggest getting your hands on this product. R + Co Dallas Thickening Spray* | £13.50 (Travel Size) | I really want to try more from this brand because I'm kind of obsessed with this volumising mist. It doesn't leave my hair sticky and you really can't feel the product in there (you use this on damp hair before blowdrying) however I really notice the difference with this - my hair just has a natural boost of volume. Kind Natured Ylang Ylang & Sage Nourishing Conditioner* | £4.99 | I've tried a few products from this brand and they're really lovely in terms of giving you good, natural skincare and haircare at an accessible price-point. I found with this, as I often do with natural conditioners, that it doesn't have that slightly slippery feeling of a normal conditioner (therefore I'm not convinced it would be as detangling). So, I'd say to be careful you don't mistake that for the product not being in your hair and over-apply as a result. It smells really lovely - I leave it in for a few minutes before rinsing. It isn't going to resurrect really damaged hair because it is quite lightweight, however for everyday hydration I did like this and it left my hair smooth and soft, as well as looking healthier. Percy & Reed Perfecting Wonder Wash Shampoo* | £18 | If you're just after simple, gentle products that will cleanse your hair and leave it shiny then I definitely recommend this product range. This shampoo is SLS-free and dermatologically-tested, which is great for me because (as I've mentioned before on this blog, I do suffer from a sensitive scalp). It's very lightweight and non-stripping, but leaves my hair feeling clean and fresh. Percy & Reed Perfecting Wonder Care Conditioner* | £18 | This is a lovely, lightweight but moisturising conditioner. It detangles my hair gently and leaves it soft and smooth. I love that it doesn't have a heavy texture or leave any excess in my hair but still does the job. It contains Aloe Vera and claims to help protect against UV damage to the hair. Overall, I really like both of these products - I personally don't wash my hair every day, however if you do then I'd recommend this pairing, because they're both so gentle and effective. Percy & Reed Perfecting Wonder Treatment + Oil* | £25 | This is a nice, lightweight blend of natural oils that I like to use on my damp hair before blow-drying. It isn't greasy in the slightest and I use 2-3 pumps spread through the lengths and ends. It's isn't super-intensely nourishing but is nice and hydrating, leaving my hair looking healthier and shinier. There's no excess at all in my hair once it's dry, which I really like, however very dry hair might need something a bit more heavy-duty. Have you picked up any new bath, body or hair products this month? I am with you on with Tangle Teaser brush for blow drying, I found it too hot on my hand too! That Yope packaging is everything!